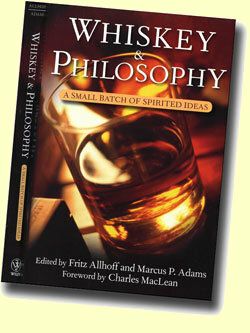 Whiskey & Philosophy is the first of its kind among whisky books, though one among many in Fritz Allhoff’s Philosophy & Something Else series. The books in this series, better known as Philosophy For Everyone, include 18 to 20, 4500-word essays on a particular topic ranging from serial killers to running. This book, written 50% by philosophers, 25% by other academics and 25% by non-academics, joins two earlier Allhoff epicurean outings that explored food and wine. Although the accessibility of the essays varies somewhat, all bring new perspectives on whisky. For those who like to ponder whisky, Whiskey and Philosophy provides lots of material to keep those brain cells busy all winter. It’s an odd mix of contributors: whisky writers who, for the most part, joust but timidly with philosophical concepts, and academics whose naïve connoisseurship many readers will take for knowledge. Yet it works well as each brings something new and enlightening to a whisky conversation that the editors skillfully synthesize into a cohesive and thought-provoking unit. Jerry O. Dalton, a former bourbon distiller with a PhD in chemistry, and an eastern philosophical bent, talks about the uncertainties of tasting whisky. “Are some whiskies better than others?” he asks. To Dalton it all boils down to what you get used to. “To a person accustomed to Scotch, bourbon might seem too sweet or grainy.” One thing is certain though; we should not trust the experts. “Given that experts apply their own standards (and biases!) to evaluation, it makes it all the more important that we taste for ourselves, thus applying our own standards (and biases! ).” The best whiskies, he suggests, are those for which consumers cast their votes with money by buying them. Hmmm, so to Dalton it’s quality, not price, advertising, or familiarity that leads consumers to make their selections. Other essays explore whether whisky makes people immoral; whisky and wild living; women and whisky and the right to have orgasms (strongly influenced by a certain American sit-com one would guess); whether the person who over-enjoys the whisky is the self-same soul who under-enjoys the morning after (written by Buddhist & philosopher Steven F. Geisz); preserving distilleries and distilling methods for their intrinsic values; and a fascinating essay by Tom Polger on whether whisky is a “natural kind.” This essay provides a clear opening to address the blurring of the fortified wine/whisky boundary as more and more Scottish malt distillers use wine to flavour their whisky – a practice known euphemistically as finishing – but Polder, a philosopher, is not up on the latest whisky controversies. So, whether they’re curled up by the fireplace with a favourite dram or sprawled in a chaise lounge with a rye and ginger, this is a book whisky lovers will go back to time and again both for amusement and for intellectual stimulation.